Photo: Debbie Radcliff The village of Oradour-sur-Glane as it stands today. 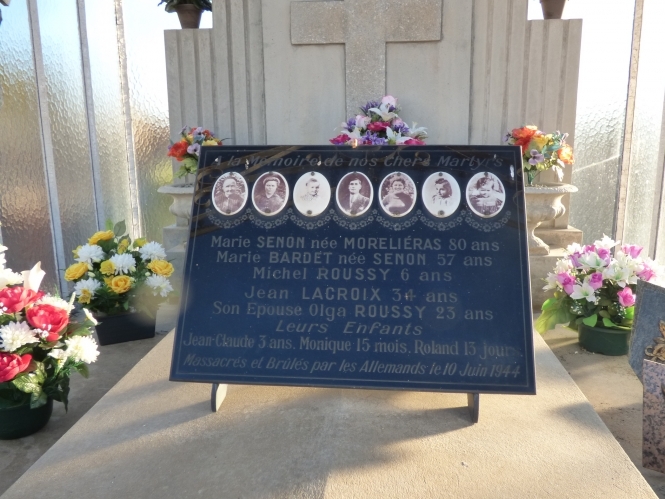 This week President Macron visited Oradour-sur-Glane to mark the anniversary of one of the most shocking massacres of WWII, and where the ruins have been kept exactly as they were on that day in 1944. Here, journalist Samantha David writes about her recent visit to the haunting monument, and the maelstrom of emotions she experienced. 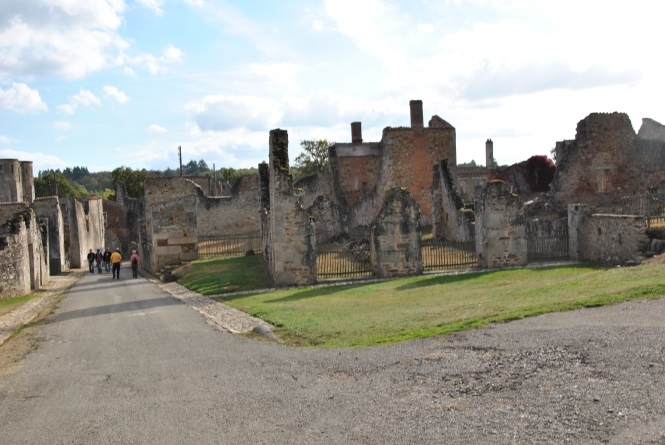 I hesitated about going to the village of Oradour-sur-Glane because its history is almost too much to contemplate. During World War II, in just a few hours, a meticulously planned and orchestrated Nazi bloodbath turned this once bustling market town into a tragic ruin haunted by ghosts. On June 10th 1944, the high street was busy with people registering their children for school, collecting tobacco rations, shopping and meeting friends in the cafés and bars. It was a normal, peaceful day in the village in la Haute-Vienne, in the Aquitaine region. So when, in the afternoon, 200 occupying Nazi soldiers from the 4th SS Panzer division surrounded the town and herded everyone into the town square, people resigned themselves to the tedium of having their identity documents checked. Even six passing cyclists had been rounded up. Boring, but that was the war. Only 20 people managed to evade the round-up and leave the town. Everyone was assembled and then the 190 men were taken off to a series of barns, and the 247 women and 205 children taken to the church. But there was no intention to check anyone’s identification. In the barns, the machine-guns were already set up. As the men arrived, the Nazis shot their legs so they couldn't escape, and then piled kindling and firewood on the wounded men and burned them alive. Miraculously, five survived to bear witness to the horror. The soldiers then looted the town, and an hour later, they set off an incendiary device just outside the church. In the noise, the smoke and the rubble, the terrified women and children fled out of the doors and windows, only to be systematically mown down by machine guns. Only one woman survived. Having slaughtered everyone, the soldiers then set the entire town on fire and stayed stoking the flames, to ensure that everything was burned to the ground. When they finally left, they left not a single building unscathed, and many of the bodies were burned beyond all recognition. The horrified neighbours who discovered the massacre, in which 642 people died, vowed to maintain the ruins. They would never rebuild, the place would never be inhabited again. A new village was constructed a kilometre away, and today the old town remains in ruins as a reminder of what happened and as a monument to those who perished. Entering the village through a sombre visitor centre and a tunnel, I expected the atmosphere to be desperate, full of fear and agony. But walking around the empty streets, I soon realised that they aren't exactly the way they were just after the massacre. Obviously, the human remains have been removed, the blood and soot washed away, the rubble has been sifted for family mementos and dangerous areas have been barricaded. 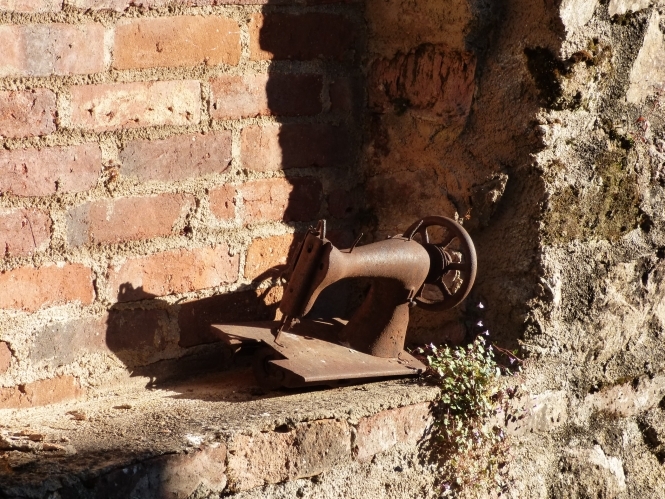 Also, burned out, old-fashioned sewing machines have been perched on top of the rubble inside many of the houses. But 72 years of rain and wind have covered everything with a film of earth. The grass has grown back, and when we visited the sun was shining and there were birds singing. It is very clean. There is no rubbish, no graffiti, no modern advertising hoardings, no traffic. Just the empty streets, the silent visitors and the ghosts of the dead. It was, in fact, strangely peaceful. Wandering down the curving high street felt like going back in time. The tram tracks which connected Oradour-sur-Glane to Limoges are still there, as are the overhead wires. Each building is labelled so you can tell what the shops were; there is a garage, several fabric shops, seamstresses, tailors, bakers, groceries, a hardware store, several commodities-exchange bureaux, a tobacconist, three schools, a post office, a large imposing hotel and many bars, restaurants and cafés. Half close your eyes, use your imagination and you can conjure up what life was like here during the war. There are plenty of clues: the 1930s cars, safely locked away within the ruins of their owner's garages, a few floor tiles, the weighing scales, laundry mangles, bicycles, and toys. You can almost imagine children playing, women cooking and making clothes, old men sitting in the cafés. But open your eyes wide again and the reality is stark: the carefully stored cars are just carcasses rusting in the ruins of their shelters. They were burnt in their garages. Everything wooden is gone. There are no floors, no ceilings, no staircases, no roofs, no furniture. The books, the photos, the carpets, personal possessions and household linens were all destroyed in the hideous conflagration. After the attack, a few spoons were recovered, a handful of wire-rimmed spectacles, some tin toy cars, some melted glass objects, and a collection of blackened watches, but very little else. 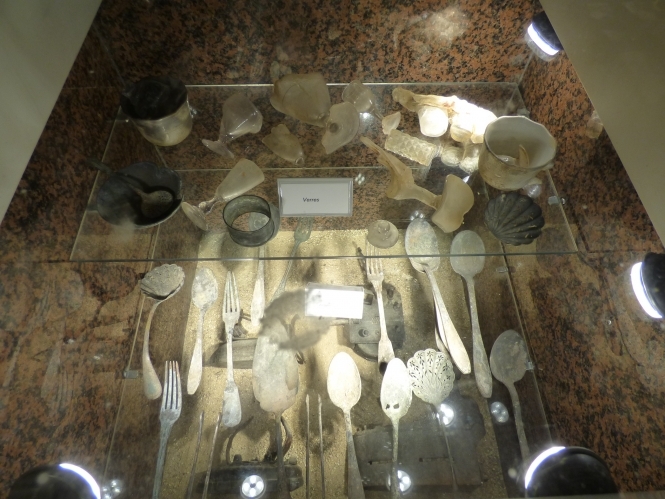 Just some fragments of human bones which lie in glass-topped coffins at the memorial in the cemetery. Fragments? Being confronted with the evidence of such extreme violence is shocking. Fragments of human bone. The pieces lie jumbled up together, just as they were found. The horror of it is breath-taking. I wandered around the graves, many of which date back years before the massacre, reading the names and the dates, absorbing the pictures of those who died. The remains of those who were slaughtered are also laid to rest here, amongst their ancestors and neighbours. But nature is at work, now. The dead have been laid to rest in peace, their remains gently being reabsorbed into the earth. The trees are waving their leaves in the air, there is moss growing on the graves of the martyrs, a rabbit hops away into the hedge, a robin lands on the fence. Whatever we humans do, time moves on and nature softens it all. Oradour-sur-Glane is the location of an atrocity carried out by humans. But so is the Colosseum in Rome. It's a chilling thought. 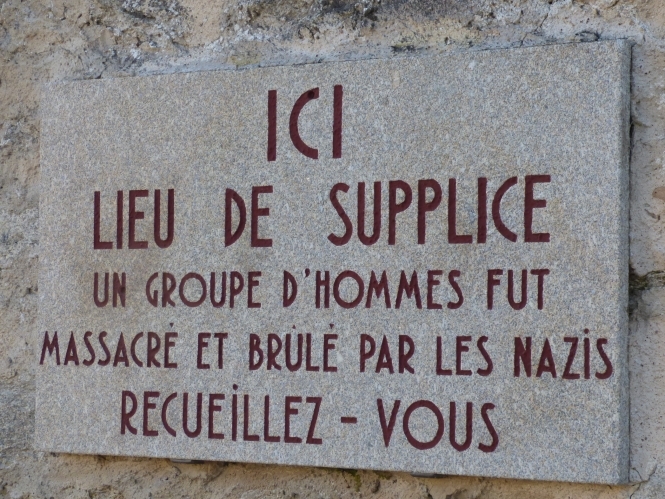 Oradour-sur-Glane wasn't the first site of human slaughter and the tragedy is that it will not be the last either. For thousands of years, humans have been slaughtering each other. War is in itself an atrocity, and always engenders war crimes. Perhaps rulers don't feed people to lions any more, but the civilian suffering in Syria cannot be under-estimated. Civilian massacres are still happening. And the causes haven't changed either. The same intolerance, racism and hatred that drove much of the Nazi movement is still driving terrorism and wars across the world. And here in Western Europe, we see that same racism, hatred and lack of compassion aimed at the unfortunate refugees, immigrants, and outsiders. The others. 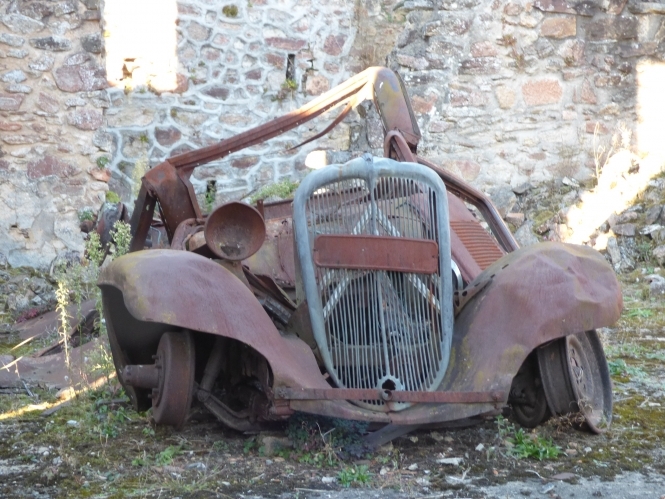 Leaving Oradour-sur-Glanes, I was haunted by the horrible question - could the massacre of innocents happen again in Europe?